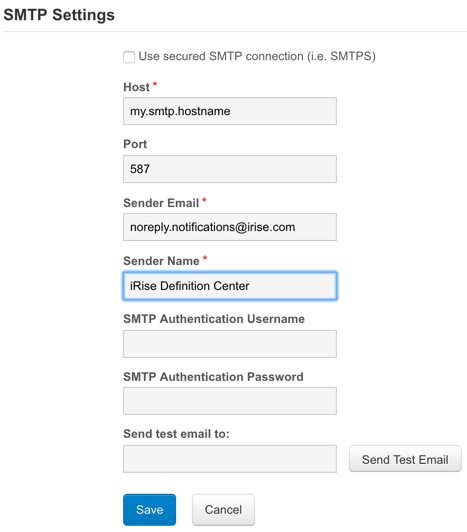 This article describes how to configure a Definition Center to use Email/SMTP notifications. The Email/SMTP Settings page enables the System Administrator to set up the Definition Center so it can send automated email messages to users. Whilst an open relay server can be used, for a much more secure environment, we recommend using an authenticated (SMTPS) server connection to set up this feature. You will need to have System Administration permissions on the Definition Center to access SMTP settings. Port - enter a valid port number. If one isn't specified, the default port 25 is assumed. Sender Email* - this required field is the email address that will be used in the "From" field of messages sent from the Definition Center (possibly belonging to the primary System Administrator). Sender Name* - this required field is the name of the sender associated with the email address above. SMTP Authentication Username - if your SMTP server is configured to require SMTP authentication, enter the username here. SMTP Authentication Password - if your SMTP server is configured to require SMTP authentication, enter the password of the SMTP username here. Send test email to: - enter an email address if you wish to test sending an email. 2. After entering this information, click Save Changes and restart the iRise Definition Center service, (under Windows Services). This configuration will allow users to receive emails with a new password. If you need your uses to send links of projects to other users, please follow the instructions below. 3. To enable the second type of communication, (sending links of projects to other users on the Definition Center or elsewhere), you need to manually modify a parameter in the irise.properties file. Save the file and restart the Definition Center server. If you are not receiving emails, firstly check that they are not going into your spam/junk folder. All SMTP activity is logged in the following log: x:\iRise\DefCenter\Tomcat\logs\smtp.log . You can access this log either by navigating to it on the server, or via the Definition Center Administration & Settings > Zip iRise Definition Center log. Contact Customer Support if you need assistance and send us your smtp.log and irise.properties file to help troubleshoot.